Welcome to Part 1 of the Homeschool Basics Series! In this first post I will discuss why we chose to homeschool our children. I hope you will join in the discussion! According to an article published at CNSnews.com on May 19, 2015, the number of homeschooled children in the United States had risen nearly 62% between 2003-2012. No doubt about it, that is a HUGE increase in parents choosing to educate their children at home! As the popularity of homeschooling rises, so do the varied reasons that parents cite for choosing home education over public or private school settings. Kyle Greenwalt discusses this change in his 2016 article for TheConversation.com, saying that although the initial catalyst homeschool movement of the 1980s was primarily religion-based, research on the recent trends shows that is no longer the case. The current homeschooling community is actually about as diverse as the nation’s population itself. Since every family has its own unique reasons for homeschooling, we really can’t make assumptions or generalizations about the reasons that friends and acquaintances are keeping their children home. What led your family to make this decision may be entirely different than the catalyst for mine. So why do WE homeschool? 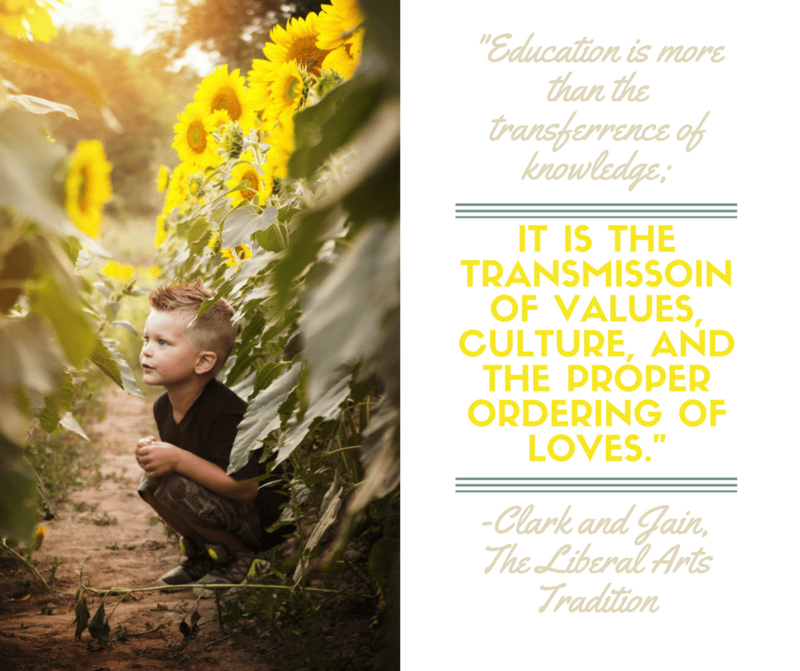 I think that the above quote from The Liberal Arts Tradition sums up our reason for home educating better than anything I could say. Education is more than the transference of knowledge; it is the transmission of values, culture, and the proper ordering of loves. As a parent, I feel that it is my responsibility to be the primary influence over my children’s education, and not just in the academic arena. Academics were certainly a big reason we chose to homeschool, especially since my husband works in higher ed himself! But an even stronger driving force in our decision to homeschool was the desire to foster a different culture in our home than what is prevalent in America today. We truly are interested in passing on our values and loves to our children, and the best way for us to do that at this time is to keep them home for their schooling. Even though the idea of being solely responsible for educating my children was very intimidating at first (and still is when I think about later years), I came to recognize that this was actually God’s calling for me as a mother, to disciple my children. There are certainly a lot of perks to homeschooling. I don’t have to rush my children out the door every morning and then bring them home late in the afternoon to do homework all evening. I can create an individualized education plan for each of my children based on their own needs and interests. I can more adequately and easily provide for our family’s dietary needs and restrictions without the hassle of sending special food and notes to school each day. My kids have time and space to be kids and pursue their individual interests. We can choose curricula that supports our beliefs and ideals as a family. I can easily adjust our schedule to work around vacations, appointments, illness or whatever else comes up. But all these advantages are not the main reason we chose homeschooling. For me, homeschool is about discipling my children. It is about having the time together to really know my kids and how they tick so that I can better prepare the soil of their hearts to receive the seed of the Gospel. It is about passing on our family values and traditions that make up our unique family culture. And on hard days when it seems like we just need to get through the next handwriting worksheet or math lesson without a meltdown, I need to remind myself of these things. It is not just about the “three R’s”. It is about the Relationships. How about you? Have you considered educating your children at home? If you do homeschool, what was the driving force behind your decision? I would love to hear your thoughts! Read Part 2 of this series, How We Homeschool, here. We share a lot of the same reasons. We have several reasons…Our time together is important and that I am the first teacher and away at school takes a lot of that time away. More reasons are God has given us these children to raise and the best way we, my husband and I, can is at home. As obvious of the rise of school shootings…Schools are not the same anymore. Even the teachers are teaching differently as they are required too. My husband doesn’t have a typical job so has great flexibility to be involved a lot with the education and guiding our children. As I have been homeschooling for 11yrs…I have learned I LOVE the diverse ages of my kids. They teach each other so much. Good and bad. It sets the stage to help make apparent how our actions make a difference in ourselves and others. Such a beautiful post! We have been homeschooling 25+ years now. I wasn’t sure in the beginning if I would be up to the task. We took it one day, one year at a time. It didn’t take long for us to be convicted that, yes, our responsibility as parents was to be their trainers and educators. Though we are far from perfect, God is faithful and continues to provide and grow us! Thanks so much for stopping by, Linda! It’s always great to hear from a veteran homeschool mom!